Singer, saxophonist, and songwriter/composer Grace Kelly plays with the heart and passion of an old soul yet with the genre-bending zest and energy of a 26-year-old. The 2018 John Lennon Songwriting Contest Grand Prize winner (country genre) has appeared regularly in the house band for The Late Show with Stephen Colbert under Jon Batiste and was highlighted on screen as a jazz soloist in the Emmy-nominated Amazon series BOSCH . The critically acclaimed vocal group New York Voices has refined their musical story to a high art. They are known for their close-knit voicings, inspired arrangements and unparalleled vocal blend. Their chameleon-like musicianship allows them to move seamlessly from setting to setting, be it orchestral/big band to the intimate trio lineup. 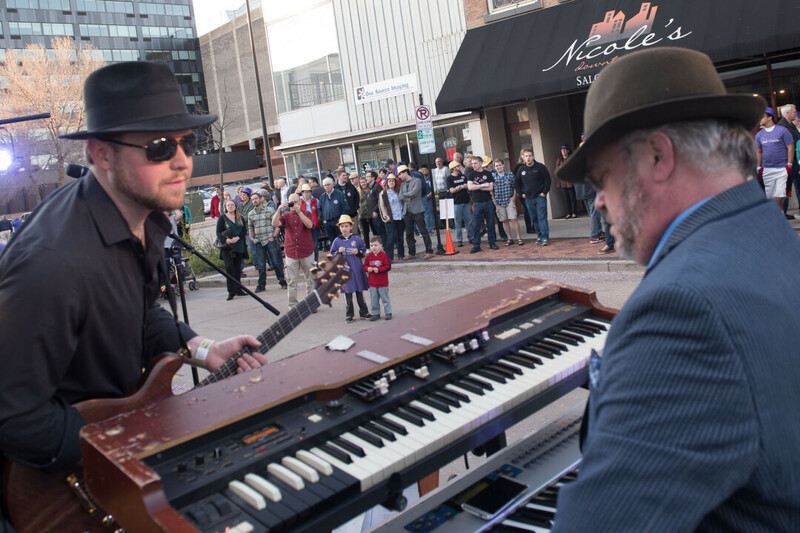 The Eau Claire Jazz Festival celebrates the true culture of jazz as Downtown Eau Claire transforms into a jazz nightclub scene. 52nd Street is a re-creation of the historic 52nd Street of New York City, where jazz greats like Miles Davis, Charlie Parker, and Louis Armstrong sat in with different ensembles in a variety of nightclubs, simply because they loved to play jazz. Over 50 bands play at indoor and outdoor venues along Barstow Street in downtown Eau Claire, featuring a variety of music styles, including ragtime, blues, acoustic, big band, indie, funk, soul, pop, hip-hop and more. It's an exciting night of live music downtown - you never know who might bring their horn to sit in! Join over 3,000 people to enjoy this once a year party! The Eau Claire Jazz Festival, in partnership with the University of Wisconsin-Eau Claire, is a regional music festival, dedicated to educating, entertaining and promoting jazz. Since 1967, the Eau Claire Jazz Festival has maintained a standard of excellence in jazz education and performance. This educational and cultural jazz festival has earned its distinction as one of the oldest and largest events by providing local, national and international artists the opportunity to showcase their creative work and by highlighting the enduring elements and important directions in this distinctly American music. Enter to win one of two pairs of tickets to the Friday or Saturday headliner concert at Pablo Center at the Confluence or a pair of wristbands to all 52nd Street venues! Find out more about The Eau Claire Jazz Festival on their website!